Astrology is best used for planning, problem solving and personal growth. In that spirit, I'm writing to let you know that the 2014 birthday reading for Cancer is now available for pre-sale at a substantially discounted price through Friday morning only. Over the past few years these readings have gained in popularity and grown in quality. I consider them some of my best work. The way the Planet Waves pricing structure works, we give the best rate to early purchasers. That's available right now. We've also shortened the window for the pre-publication price -- which is currently $29.95. 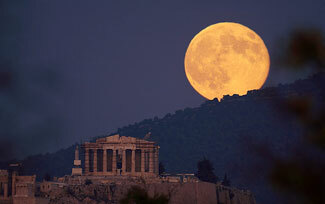 Apogee Moon rises over the Acropolis, Athens, Greece. 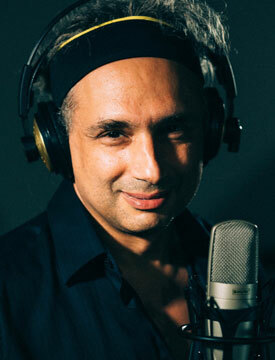 Photo by Anthony Ayiomamitis. You may know that Jupiter is currently in your sign, and makes its way into Leo on July 16. Rather than losing Jupiter, this is more like getting a bonus prize -- a year of Jupiter in your house of finances and self-esteem, which happens to be Leo -- about the best sign you can want on this angle of your chart. I will have lots to tell you about this -- and an update on the relationship themes of Pluto in your 7th and the "career revolt" of Uranus in your 10th. Stay tuned -- I'll be recording it soon. Remember, this half-price offer lasts only until Friday morning, so take advantage of it now. Sign up online or call Chelsea at (877) 453-8265. If you order by phone, we'll have an early renewal offer for you, and if you're not a member or subscriber, a lovely discount introductory offer.